These instruments have been completed and have found themselves happy homes either with myself or a customer. Images are downsized, please click the picture to view its High Resolution version. 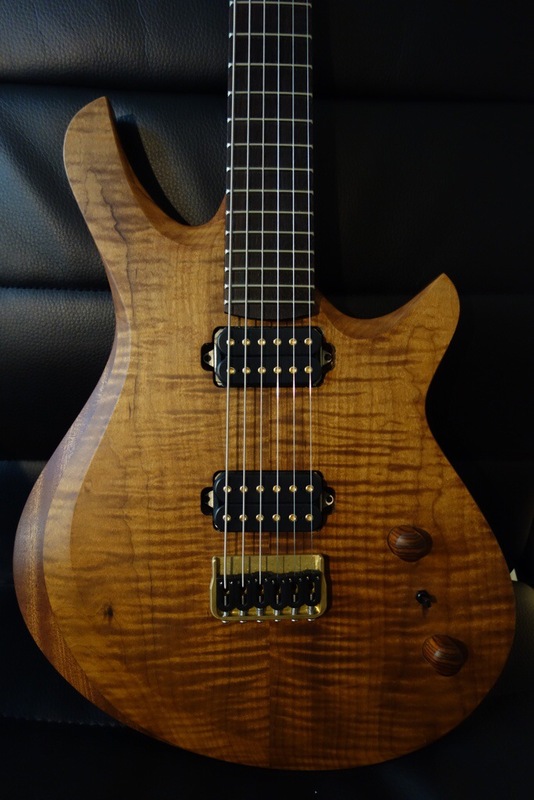 Burl Maple 6 carved top Solid Body, Sapele back. Pau Ferro FB/Monterillo Neck. 26in Scale Length, jescar frets, Dimarzio Gravity Storm Neck, Titan Bridge. String Saver saddles, Hipshot Hardware. Bournes Pots. Finished with Tru-oil and waxed with Odies Wax. SOLD. 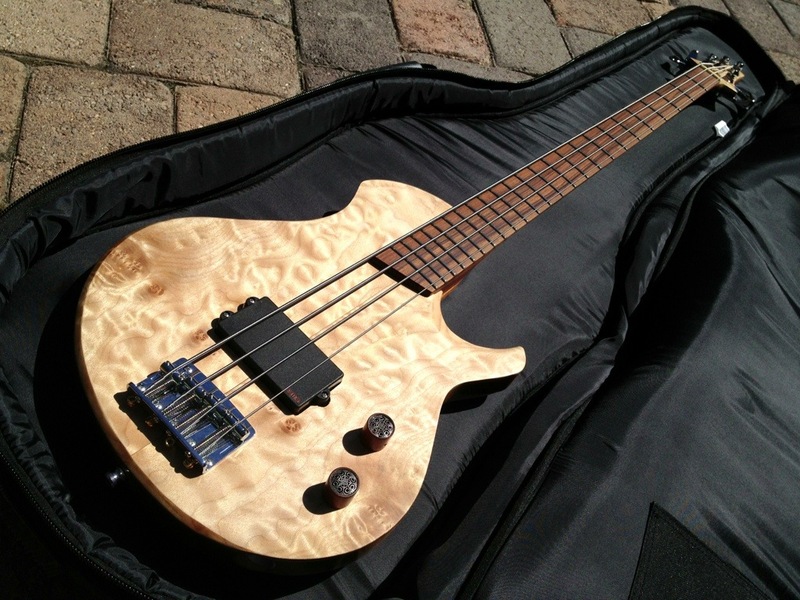 This is the Roasted Maple Flat Top with Contoured Armrestl. 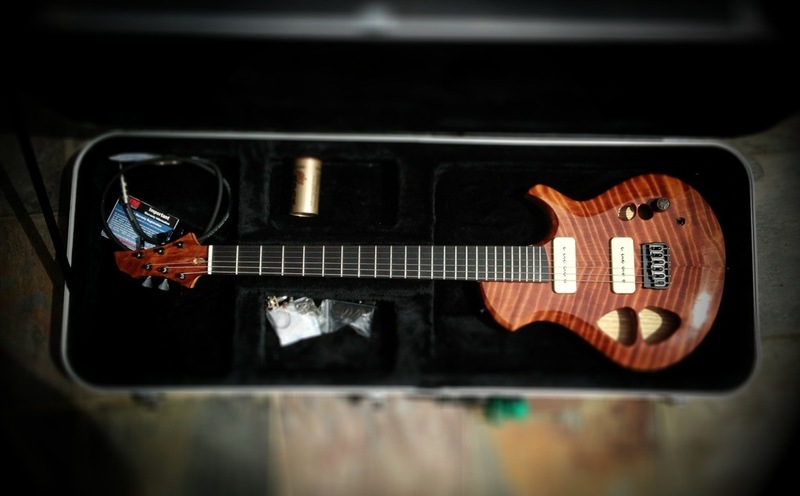 It is a solidboy guitar with a sapele back and a monterillo/Indian Rosewood neck. It will be equipped with jescar frets, hipshot hardware , Dimarzio Dominion Bridge and Neck pickups. 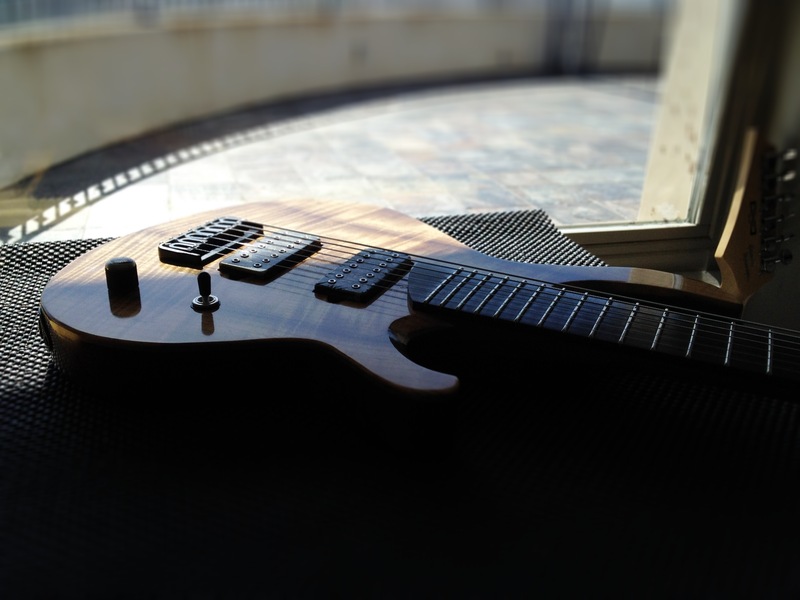 Its 26″ Scale length with 6 strings tuned to E Standard by Default. This model was finished with Odies Oil and Wax. This instrument will find itself in the loving home of Jason Kane. 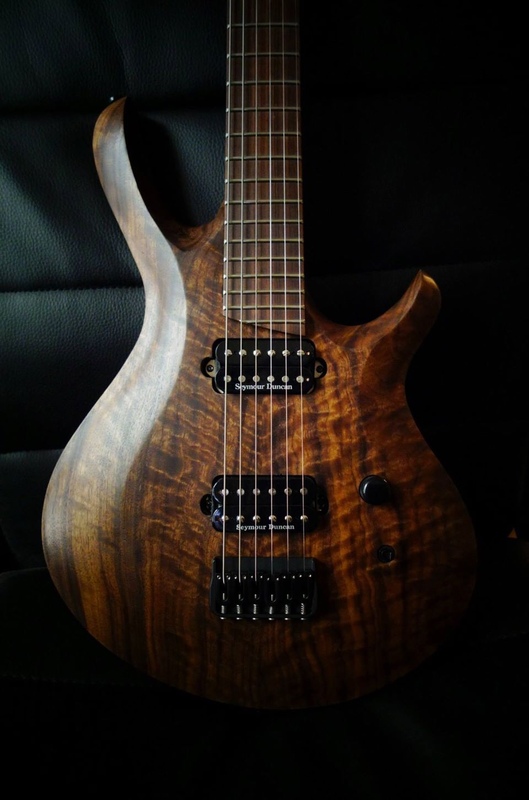 This is a Figured English Walnut Carved Top with Sapele body made for Ryan O John. Neck is Monterillo with a pau ferro FB. Stew mac Frets and Seymour duncan Custom 5 bridge and Jazz Neck Pickups. Hardware is all Hipshot, Daddario Strings. 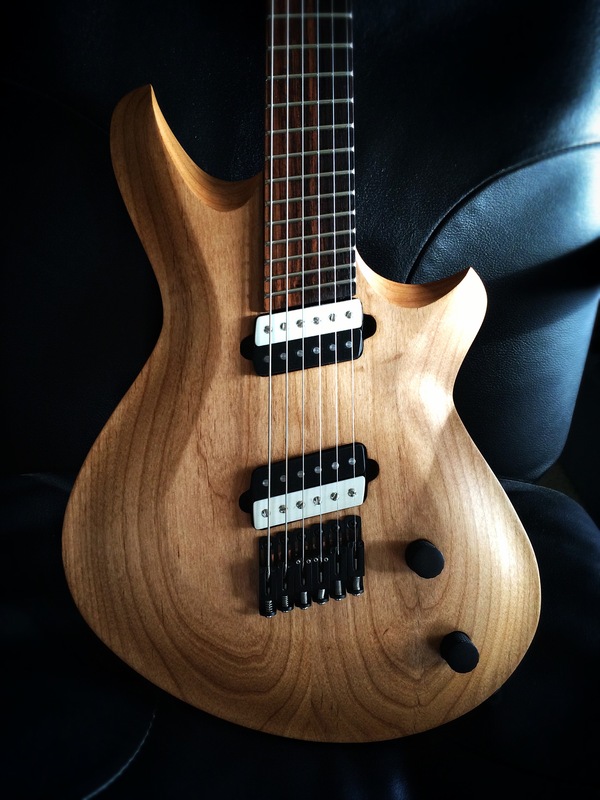 26″in Scale Length tuned to Eb Standard by default. 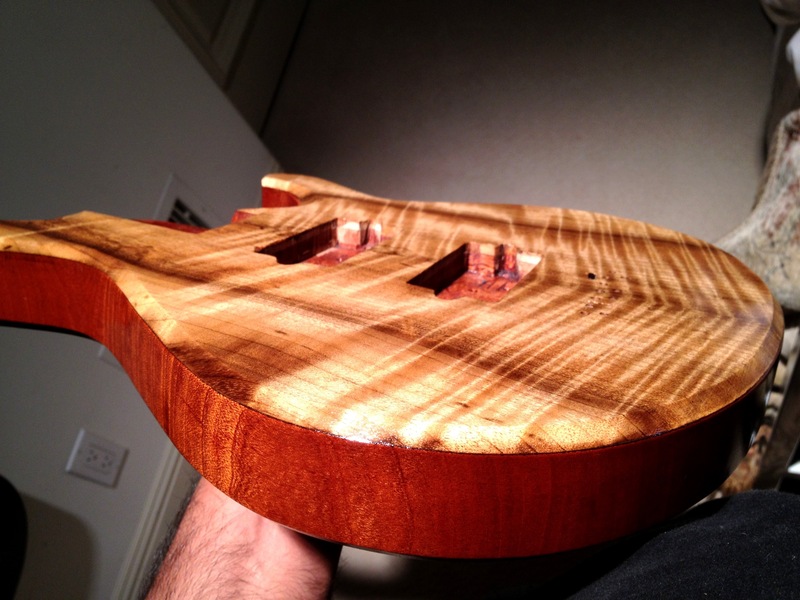 This guitar was finished with Teak Oil and Wax. Brass Side Dots This is a Figured Redwood Contour Top with a Hollow Swamp Ash Body. 26 Scale length 24 frets. Bareknuckle Supermassive bridge P90 & Nantucket P90 neck wired RPRW for hum cancelling middle position. Neck is three piece flamed maple with bocote stripe. Fretboard is Macassar Ebony. Hipshot hardware and Daddario Strings. Brass Side Dots This is a 34″in scale 4 string bass guitar. 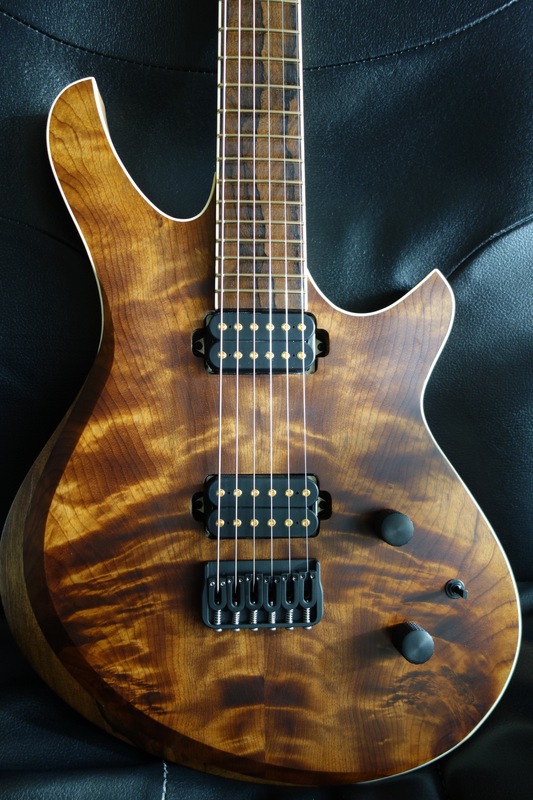 Quilted Maple Top with african mahogany back. 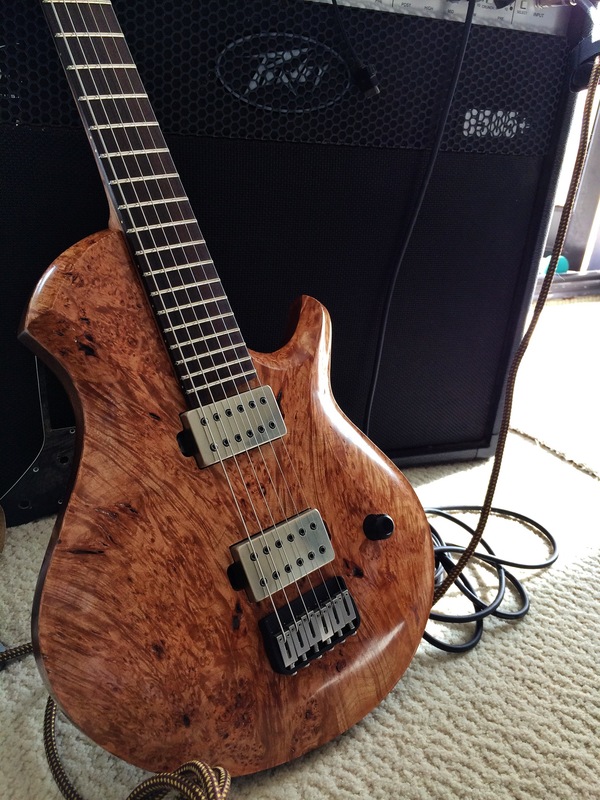 Bubinga neck with burl maple stripe and pau ferro fretboard. EMG MMTWX single active pickup. Hipshot bridge and Gotoh tuners. Finished with Tru oil and wax. Brass Side Dots. Currently in the loving ownership of Matthew Morello of Mr. Dream in NYC. 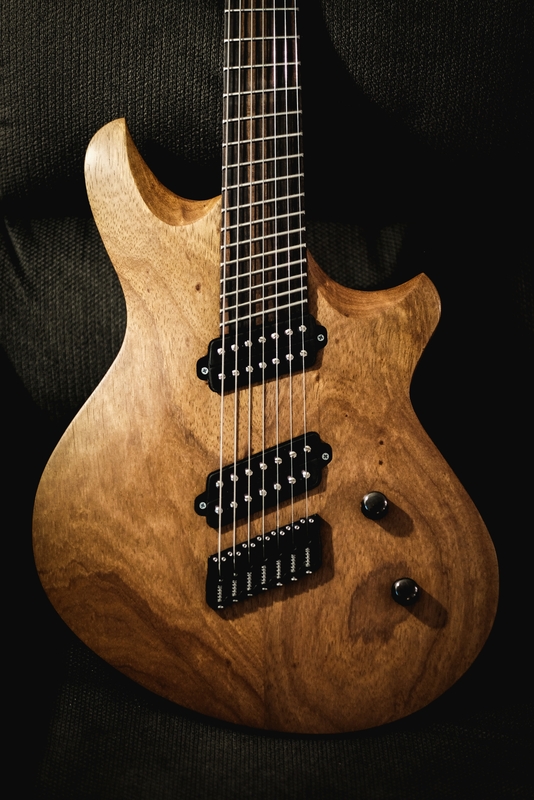 This is a Seven string 27.5 in Scale length baritone guitar. Myrtlewood top and sapele body. Ebony Fretboard with a mahogany neck. Bareknuckle Aftermath Bridge & Warpig neck in battleworn camo finish. Hipshot bridge, Sperzel Tuners. Tru Oil finish. Brass Side Dots. SOLD. That is beautiful work! Great photography as well. I am just starting out building guitars, strictly as a hobby. I am planning on using Odie’s oil as a finish. Thank you Phil! and I wish you all the best! please write or message me if you’ve got any questions you think i might be able to ask. I started out with barely any tools or knowledge of woodworking lol see for yourself check some of my first posts from back in med school….oh man those were bad. And odies oil is a fantastic finish. Find Odysseus Cornwall on facebook and ask for James or Tracie and tell them you saw it here, they might give you a discount or a sample of something! they are awesome people. Good luck and Link me when you post pictures of your progress! SO glad I stumbled across this. Your work is amazing. wonderful! Beautiful work. I’m starting my own guitars with mahogany and ebony and now I cannot wait for day light to begin. I think your finishes are outstanding! I have been re-invigorated by your work!! Steve that means the world to hear that! its why i started cataloging everything in the first place. Its to give back to all the teachers that taught me. I learned by watching pictures of build stories and stuff like that. no formal lessons so it always means the world to me to hear when someones happy with what im doing!